Hurricanes centre Ma'a Nonu says his team's poor Super Rugby form has him feeling the worst he has ever felt in his career and that he is "desperate" to find the improvement that will help protect his All Blacks spot ahead of the World Cup. The Hurricanes have just win from their opening six games and they have scored the fewest points of any of the 15 sides so far. Nonu's lack of impact has been one reason behind their failure to put points on the board although their is an argument that the lack of support around him is making the All Black's task that much more difficult. In contrast to in-form Crusaders star Sonny Bill Williams, a rival for Nonu's No.12 shirt at the World Cup and a player on the rise who seems destined for big things at the September-October tournament, Nonu is stuck in a rut and blaming no one but himself. 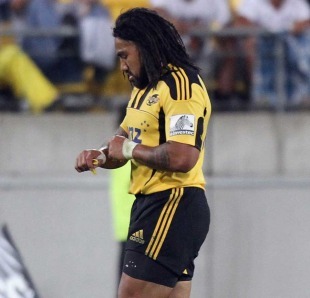 "I can't speak for anyone else, but I'm probably the lowest I've been in rugby," Nonu said in the Dominion Post. "I don't know, I just feel terrible to be honest. From a team perspective I think the boys played well. The loosies tonight were great, the forward pack, but I'll put my hand up - I didn't feel like I did much." Nonu, 28, refused to be drawn on whether his team-mates, and in particular fly-half Aaron Cruden, were partly culpable for his poor start to the season. "I don't want to say anything against anyone. I believe in this team, I love [this team]. I can't blame anyone else, but I'm just not getting any space." Despite its major overhaul, Super Rugby's importance takes a back seat in a World Cup year but Nonu rejected the suggestion that the pursuit of All Blacks jersey was undermining the Hurricanes' team efforts, pointing to the fact selection often follows success. "I'm so desperate [to turn things around] it's not funny," he said. "Of course everyone has it at the back of their minds, but why would people not be performing because of it when they desperately want to make that side? "Look at the Crusaders, they're on a roll - the Blues are playing well, the Highlanders ... we're just not clicking. We have to believe. I think we are overthinking things. We get the ball to space and we rush. We had opportunities tonight, but we turned into headless chickens." Hurricanes skipper Andrew Hore agreed that team success was the best bet for their All Blacks hopefuls to earn their chance. "It's really about us now and personal pride," Hore said. "You can look at it selfishly, but you have to have a team to help you push on to higher honours. You can look at the World Cup which is a big thing, and we want to make sure we have as many players in our team playing as well as they can to put their hands up for that as well."